The 3 Day Signature Cleanse is a mix of raw, organic, cold pressed juices and blends to deliver an energy packed day and ensure your body receives the diversity of taste and nutrients. Each of the 18 bottles are hand crafted and poured right before your box is packed. Three days of our Signature Cleanse includes 18 juices/blends according to the Season and in rhythm with the life as according to alignment with your body. 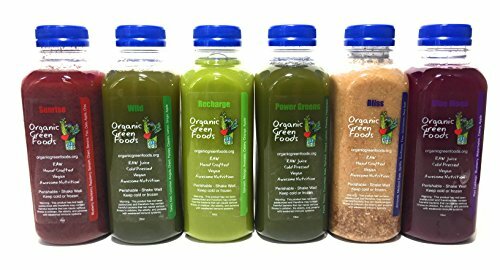 Our Cleanse is raw and made fresh to order! Your Pressed Juices and Blends are Hand Crafted by us and flash frozen right before we ship to ensure safety during travel. All Ingredients are Seasonal - 100% Fruit, Vegetables, and Herbs - NO preservatives, artificial colors, artificial flavors, chemicals, etc. If you have any questions about this product by Organic Green Foods, contact us by completing and submitting the form below. If you are looking for a specif part number, please include it with your message.